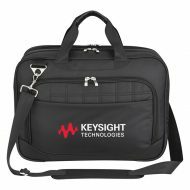 Impress clients with this custom branded RFID computer backpack and briefcase! Made of a durable 840 denier ballistic polyester, this promotional RFID backpack has adjustable padded tuck-away shoulder straps with two padded web carrying handles, front double-zippered organizer compartment for accessories with inside zippered pocket protected by RFID shielding material sewn into the lining, top zippered screen cleaning fleece-lined pocket for cellphones, two zippered main compartments with padded back and lockable D-ring zippers for maximum security, sternum strap for secure fit and trolley sleeve that attaches to wheel carts vertically or horizontally. 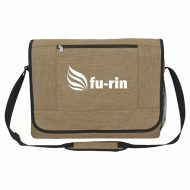 Measuring 12″ x 18″ x 6.50″, this custom logo printed RFID backpack accommodates most laptops up to 17″ and has a 37″ USB cord inside with outside charging port for easy charging access (power bank not included). Order for your team or your frequent travel clients today!